Being in love can happen involuntarily, we might feel attraction or lust towards anyone and start obsessing about them. We meet someone and we feel a rush of certain chemicals in our bodies that trick us into believing that we love this person but this rush doesn’t last long. It is when the two people share a bonding, understanding, and belongingness that goes beyond the initial rush and infatuation phase, the relationship becomes throbbing, fulfilling and long lasting. When couples have gone past the initial glittery stages of love, it is then we can say they are both in together for a long haul and chances are they aren’t just romantic partners but good friends to each other. It is then we can be sure that the chances of the relationship being happy, fulfilling and long lasting are infinitely higher. Having a partner who loves and cares for you feels wonderful, but if he/she is also your good friend, this takes the relationship to an entire new level! Real relationships don’t mean facebook official posts or cutesy Instagram pictures together. They don’t even mean daily good morning or good night texts or happy hours together. A great friendship also does not mean just celebrating the good times together. It means sailing through the bad times and failures together. When you know that your partner would do everything possible to help you out in troubled times and you would do the same for them, you have got a relationship and friendship that’s worth its weight in gold. The true sign of a good relationship is when you got each other’s back, no matter what. When your partner is also your best friend, you share an incredible mental and emotional compatibility with them. You can talk to them for hours effortlessly about anything under the sun and you can also enjoy sitting in silence with them, doing nothing together. When two people are together, it is natural to have difference of opinion sometimes. But when your partner is also your best friend and you share great understanding and respect, you have healthy discussions with them instead of mean and nasty fights. You try to find out a solution or a common ground and don’t end your relationship over petty fights. We all have our inner nerd, geek, wild, dark or crazy side. We all have some fantasies, crazy whims or quirks that we don’t generally share with the world. 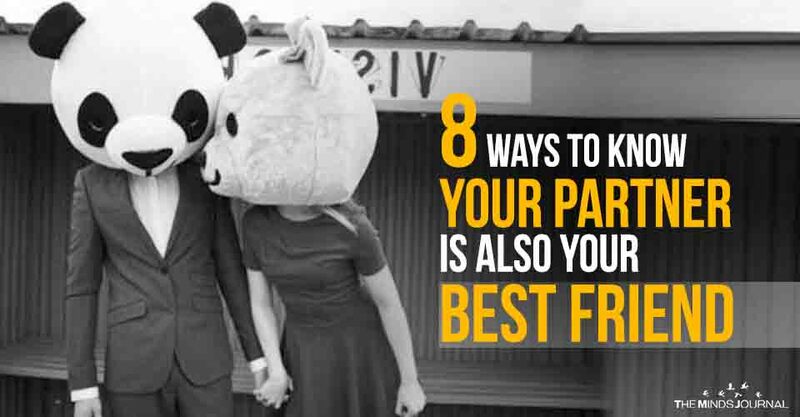 If your partner is also your best friend, you will be able to reveal all your sides to them fearlessly. They will give you the space to be 100 percent yourself without any fear of judgment or ridicule.